Naomi Ash was born in New Orleans and raised by her mother, Patsy, a medium who schooled her young daughter in the parlor-trick chicanery of the trade. From Naomi recreating presences with table cloths to providing the voice of the dead by talking through a fan, their act is part theater, part magic, and a little too much playing with the letter of the law. Eventually they must beat a hasty—and forced—retreat from New Orleans, relocating to Train Line, New York. A sleepy village founded and inhabited by others with a spiritualist bent, Train Line is populated with card readers, table levitators, and crystal-shop owners. Low-rent “Psychic Faires” are held at the local Holiday Inn, and Patsy’s newest creation, “The Mother Galina Psychic Hour,” is on the local radio station. The town is a curious mix between old school “table rappers” and the New Age, and it is here that Naomi comes of age, learns the trade, and falls in love. But love is not only a many splendored thing—it can be dangerous as well. And for a young woman caught between fraud and truth, between the world of the living and the world of the dead, and between the secrets and lies of her youth, the past and present will come together in a rush of truth and consequence. 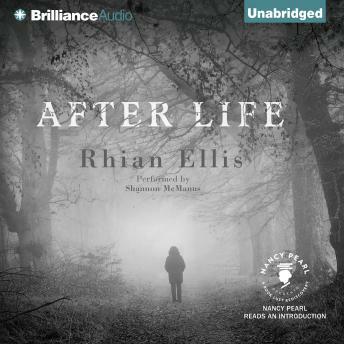 Hailed as “a study of eccentricities, which rises above the merely quirky to address those issues of life, death, memory, and love that preoccupy us all,” After Life is a stunning first novel of extraordinary suspense and evocative imagery.